Our dogs are picky eaters. We're well aware that pets are supposed to be fed a steady diet of one type of food, but our mutts get tired of the same thing over and over, just like people do. As evident as it is with their main breakfast and dinner type foods, it's even more so with treats, so we try to mix it up for them, since they're much easier to control when they're actually interested in whatever "cookie" Sonia's holding in her hand. 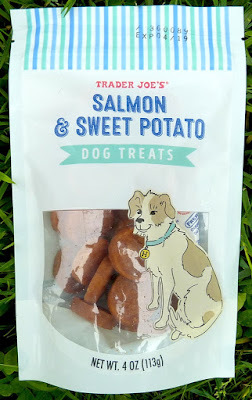 At $3.99, these weren't the cheapest option we've seen at TJ's, but with only two ingredients—Atlantic salmon and sweet potato—we figured they were worth a try. 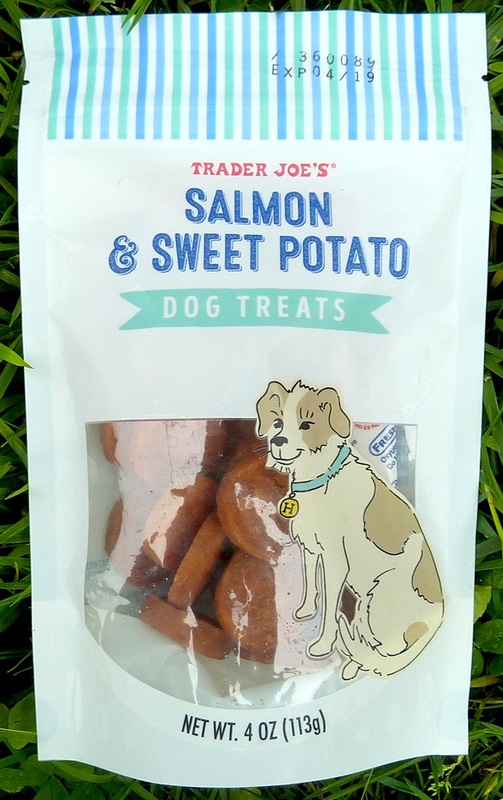 We know from experience our dogs love salmon—even the salmon we're not thrilled with ourselves. Also, the bag is full of mind-blowingly helpful tips like, "Please provide fresh drinking water for your dog at all times." Gosh! Thanks, Trader Joe's. Insert macabre, sarcastic remark about pets dying of thirst. Hopefully we'll be able to hang on to Alfred and Sadie a little longer by putting that wisdom into practice. Four out of five paw prints from Sadie. Three out of five paw prints from Alfred. Love it that TJ have simple pure dog treats. BTW, it's extremely good for your dogs to be fed a wide variety of food and not be on the same thing day after day. Mine eat 4-5 different brands plus a large selection of dog friendly fresh vegetables and giblets. Wow that’s an awesome ingredient list! So much dog food is full of really crummy stuff. By pet food standards, that’s a good price given the quality. I think they have to put the water disclaimer on the label; I’ve seen it on pretty much every food/treat bag.